Andrews McMeel Publishing, 9780740738173, 152pp. "Rear Admiral Steve Kunkle, commander of the carrier strike force, grimaced at a Doonesbury comic strip from the Japan Times. It showed a Navy pilot thinking 'Oops!'" 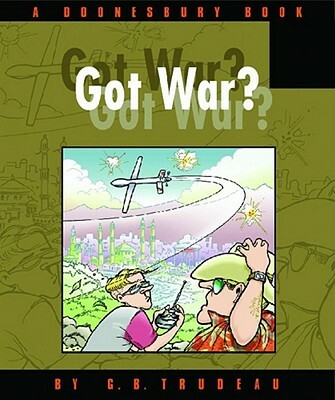 As Doonesbury shifts to a wartime footing, the strip's major players find themselves pre-positioned for the coming cakewalk. Weekend warrior B.D. leaves the Fighting Swooshes of Walden in the care of acting Coach Boopstein, returning to the sands of Kuwait as Camp Blowback's Public Affairs Officer. Among his charges: Roland Hedley, veteran of a grueling combat training program designed to keep media folk from getting capped. Offshore, the irrepressible Morale Officer Lieutenant. Tripler goes live ("Good MORNING, regime-changers!") to lift the shipbound spirits of his pre-swarthy charges, while offstage, Viceroy-in-Waiting Duke prepares to answer empire's call. Stateside, Mike takes up a flanking position on the sofa to log some serious CNN time, while the Reverend Sloan girds his loins for peace: "Look for us on TV-we'll be a million strong." Marching to the beat of a different cause, Zonker's old surfing mentor tries to enlist Z in a desperate fight to liberate Left Coastal access. Protests Zonk, "What can I do? I am but one dude!" Meanwhile, Jeff Redfern is but one CIA intern, yet he manages to launch a Predator drone and, using basic Nintendo training, knock out an Al-Q ammo dump. Also taking a hit, Trent Lott, busted for giving props to segregation. "I was trying to say I was down with the hood!" he backpedals, realizing too late that Mr. James Crow has finally left the house. With Alex declaring eco-jihad on SUVs, and Elmont launching a daily assault on coherence as on-line blogger "Jenny McTagart, Girl Pirate," it's hard to see a peaceful world ahead. But Jimmy Thudpucker can. Waging war on the recording industry, he and other filesharers have a vision of ultimate change de regime: "The suits die off, and Pepperland will be free again."